Spark ignited, 4-stroke, lean burn or rich burn or "clean burns"
and particulates. Each engine type has its own particular emission signature. Use of gas analysis for e.g. Stationary gas turbines were originally developed as air craft engines and are applied to drive generators. Installations are used to generate peak load electrical power and often, together with a waste heat boiler, to generate heat energy. The flue gas composition is very similar to that of gas fired furnaces. Typically natural gas, landfill gas or biogas is used as fuel. Hint: A dynamic partial vacuum exists at the measuring point MP 1. The sampling point therefore must be carefully sealed in order to prevent ambient air from being sucked in and cause incorrect measurements. High temperatures are required in almost all plants in the chemical and petrochemical industry to produce final or intermediate products from raw materials. In most cases, superheated steam is used for this purpose and is generated by process heaters. 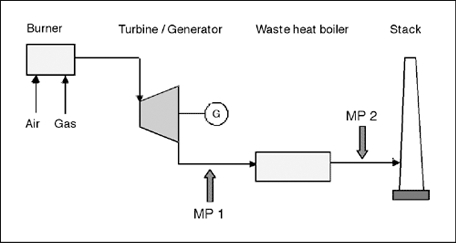 The figure below shows such a plant schematic with a process heater that delivers steam to a double-walled reactor vessel where the production process performs at high temperatures. value for easy upgrading at any time. Great Options – Add industrial probes and easy Emission software for easy trending and graphing analysis, or sample gas conditioning for longer term testing. Coal-fired power plants belong to the group of thermal power plants that generate electricity from coal. The coal is crushed, dried, and ground in a mill. Together with preheated combustion air the powdered coal is blasted into the furnace and burned at temperatures of approximately 1000°C (1832°F). The furnace is surrounded by the heat exchanger which comprises a tightly packed pipe system with boiler water flowing through. The water is heated up and thus fresh steam is generated with a pressure of approximately 200bar (2900 psi) to drive a turbine. The flue gases escape from the furnace, pass through different gas scrubbers and are released into the atmosphere through the stack. The steam, after leaving the turbine, is cooled down to water and recharged into the boiler system again. grounded to avoid dangerous static electric shocks. Trouble shooting large combustion applications or tuning ammonia injected SCRs has always been a slow, challenging and tedious process. 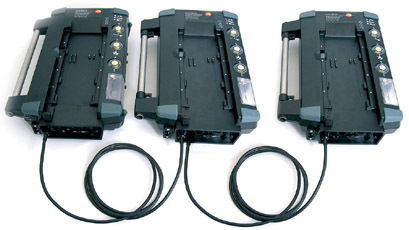 It often involves sampling at numerous port locations, over long periods of time and often with large bulky analyzers. Plus testing conditions are unpredictable due to adverse weather and climate locations. Conclusions drawn from data taken at various points-in-time are suspicious at best or very expensive at worst. Understand more about your SCRs and make qualified decisions using testo's unique 350 multi-analyzer solution. Determine the cause-and-effect relationships in real time. Complete the testing and see results in minutes not hours and days. The testo system reduces labor costs, provides uncanny flexibility, gives you more valuable parameters and the confidence to make the right decision. 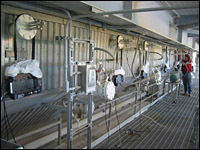 valves to control high pressure; heated sample lines. Refineries (more precisely crude oil refineries) comprise a variety of different processing plants at one site where marketable products such as gasoline, diesel oil, plastics, fibres, detergents etc. are produced from crude oil in several processing steps. The production steps proceed at high temperatures causing the need of numerous firing plants in one refinery. The refining process starts with distillation of crude oil at atmospheric pressure and appr. 350°C (662°F), whereby gasoline, gas oil, or kerosine are separated. The residues are either utilized as heavy fuel oil or further processed in a vacuum distillation at 400°C (752°F) to create lubricating oil or bitumen, for instance. The great variety of products requested by the market, however, cannot be realized through distillation alone. 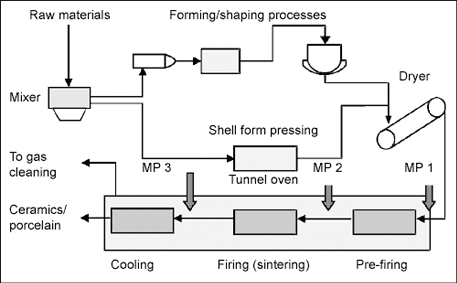 Special processes are used to transform the crude oil distillates into light hydrocarbons (cracking processes) with following refinement steps (reforming processes). 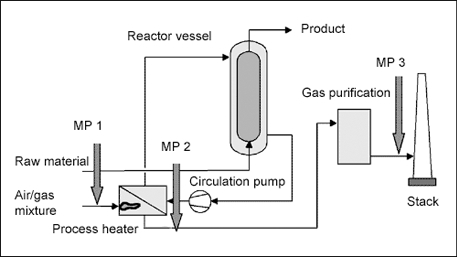 Both processes operate with the use of catalysts at temperatures of 500°C (932°F) and above. 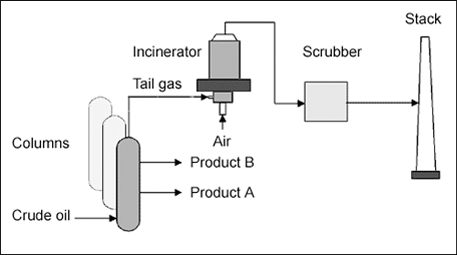 The figure below shows schematically the distillation columns, the discharge of final and intermediate products and the exhaust gas (tail gas) treatment through incineration and purification. Refineries are emission sources for pollutants such as SO2, NOx, H2S, particulate matter and many hydrocarbons. Emissions result from diffuse as well as concrete sources, e.g. firing plants. Emission reduction is achieved by using appropriate fuels, special firing measures and flue gas purification plants. Because of the very large variety of different plants in a single refinery complex no specific measuring point locations are mentioned here. Once more, however, it is referred to the large number of firing plants operated in a refinery for steam generation and tail gas incineration, which offer many applications to gas analysis. The best selling Set for NOx testing on boilers and burners. Grinding of the raw materials, drying of the material using hot exhaust gases, heating of the raw meal up to 800°C (1472°F) with removal of CO2, firing in a rotating kiln, cooling, mixing with gypsum, and grinding to cement. 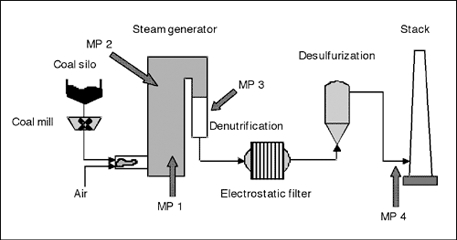 The exhaust gases pass through an evaporation cooler and some gas cleaning plants (not shown in the figure below) including an electrostatic filter before they are released to the atmosphere. 5. The sampling probe must be grounded when mounted at a stack built of bricks! 6. Depending on the kind of fuel also limit values of lead (as dust) as well as of thallium and cadmium may be relevant. The term ceramic describes various kinds of material resp. products made from clay and additives and solidified by firing at high temperatures. The raw materials are Kaolin (a clay of certain composition), quartz (SiO2) and feldspars (a rocky mineral of different silicates). The materials are prepared by grinding, washing, filtering, and mixing, pass then through the shaping processes and are, at the end of the process, fired in a tunnel kiln in several steps: pre-firing at appr. 900°C (1652 °F), firing (sintering) at 1400°C (2552 °F) and finally cooling. Colors and glaze are applied either during the sintering phase or in a separate step. Firing temperature and the composition of the oven atmosphere are decisive for the quality (solidity and appearance) of the final product. The exhaust gases of the oven pass through several gas cleaning installations; very often the collected powdered material is recycled to the process. Hint: Aggressive components (HF, HCl) may be present in the exhaust gas. Therefore the use of a heated sampling system is recommended. 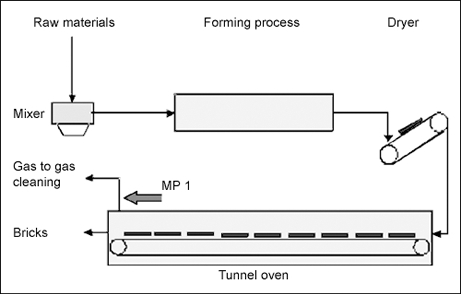 MP 1-3 in the raw gas between the different firing steps to optimize burneradjustment, to secure high and constant product quality, and to determine the drying level. MP 4 (not shown in the figure above) in the clean gas to monitor the performance ofthe cleaning installations and the emission concentrations(compliance with regulations). Bricks are manufactured from clay that is fired in brick kilns. The raw materials are crushed, mixed and dried to a given level of humidity and then pass through a forming and drying process before the are placed on a car riding through the tunnel oven for firing at 900-1300°C (1652-2372 °F). The flue gases mainly include dust particles but also sulfur and nitrogen oxides or HF may be present. 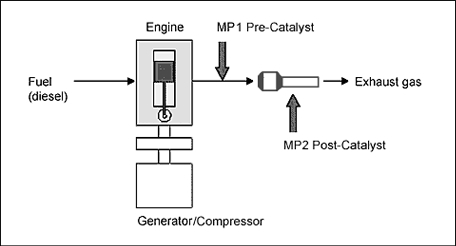 MP 2 (not shown in the figure above) in the clean gas to monitor performance of the cleaning process and the emission concentrations for compliance with the regulations. A 330mm (13") engine probe with 2,1m (7') teflon-lined hose including pressure relief (no thermocouple) and 1/4" tube fitting. This configuration provides an excellent means to connect to: customer Teflon lines and sample probes; flow meter and shutoff valves to control high pressure; heated sample lines. CO2, efficiency, excess air , loss, corrected NOx, lbs/mmBtu, Tons/day, gm/hp-hr, and more.